BRISTOL - New York’s 5-2 victory on Wednesday afternoon over New Jersey was much different than the Empire State’s first two. After a pair of blowout victories to begin the Mid-Atlantic Regional, New York found itself cruising yet again. With one hit allowed through three innings and less than 40 pitches, New York starting pitcher Derek Mendez was in command. Then New York hit a speed bump in the fifth inning. Dylan Passo’s single loaded the bases for New Jersey, giving the Garden State squad its best opportunity of the game, down 4-1 with one out in the inning. It also provided New York with its first true challenge. New York manager Joseph Calabrese pulled Mendez for Chris Bedford, who started the first game of the tournament against Washington D.C.
With all the eyes at Breen Field upon him, Bedford featured a blazing fastball to go with a devastating curveball to retire consecutive batters and lead New York into Saturday’s championship game with the victory. Gaetano Alfano and Dylan Briggs had the hits before Passo. Bedford went the rest of the game, allowing one earned run with three strikeouts in his 1 2/3 innings. The start from Mendez can’t go overlooked, though, as he was steady on the mound, pounding the strike zone and letting the defense behind him go to work. Mendez pitched 4 1/3 innings, allowing seven hits and striking out three with no walks. At the plate, Steven Martinez continued to be one of the most impressive hitters in either the Mid-Atlantic or New England Regional. Martinez finished 4-for-4 with four singles and scored two of the five New York runs hitting out of the No. 3 spot in the batting order. Chris Cancel (2-for-4) and Robert Cavalieri (2-for-2) also had multi-hit games for New York. Cancel drove in three of the five runs. Bruno, Mendez and Puglisi added the other hits for New York. Leland Ossner was New Jersey’s most dangerous hitter, with a 2-for-3 day, including a two-out triple to left field in the bottom of the first inning. Kevin Toth, Timmy Naughton and Alfred Delia each chipped in a hit for New Jersey. New Jersey starting pitcher Reid Tully struggled after pitching a scoreless inning to close out the first game against Maryland. Tully lasted 3 1/3 innings and was hit hard. He gave up seven hits, walked five and was charged with four earned runs. New Jersey will face the winner of Thursday night’s game between Maryland and Pennsylvania on Friday night at 7 p.m. with a trip to the championship game on the line. 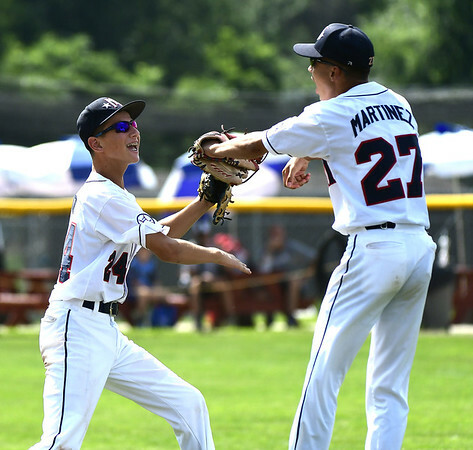 New York will have two days of rest and is set to feature Bruno on the mound with a trip to Williamsport, Pa., for the Little League World Series on the line. Already with five scoreless innings and 11 strikeouts in the tournament to pair with his confidence, Bruno may be just the guy New York wanted pitching in a championship game. Posted in Newington Town Crier, General Sports on Wednesday, 8 August 2018 20:40. Updated: Wednesday, 8 August 2018 20:43.